Starting Point-Teaching Entry Level Geoscience > Games > What is GBL? When Is Learning a Game? Competition: the score-keeping element and/or winning conditions which motivate the players and provide an assessment of their performance. Note that players are not necessarily competing against each other. In fact, a lot of games have players working as a team to overcome some obstacle or opponent which is built into the game. Engagement: Once the learner starts, he or she does not want to stop before the game is over. Lepper and Cordova (1992) refer to this phenomenon as "intrinsic motivation" and ascribe it to four sources: challenge, curiosity, control, and fantasy. Immediate Rewards: Players receive victory or points, sometimes even descriptive feedback, as soon as goals are accomplished. Achievement: Each lecture or lab is based on objectives for students to achieve: new understanding and skills to master. The activities and material challenge students. Motivation: Science is about topics that are fundamentally interesting. Instructors further motivate students by stressing connections between the course content and the students' own lives and concerns. Assessment: Strictly speaking, the reward for doing well in school is increased understanding and new abilities. These are represented in terms of grades and credits, sometimes more detailed feedback. So the challenge for the designer/instructor is to combine the two in such a way as to enhance the strengths of each approach, to make learning fun and to make games more useful. What Makes a Good Game? When is a Game Educational? Make learning integral to scoring and winning. It is not enough to simply incorporate course material into a game. If it is possible to score and win without learning, students are likely to do so (Lepper and Cordova, 1992 ). What Kinds of Games Do College Students Play? A look around the campus reveals that students engage in all kinds of games. Video Games: These are played over the Internet, on personal computers, or on specific game consoles hooked up to televisions. Many young adults, including college students, spend hours every week playing computer games. Role-Playing Games: These are generally cooperative and highly engaging with a subtle way of handling scoring (partly with "experience points"). 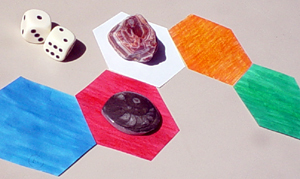 Non-game educational role-playing is described in another Starting Point module. Board and Card Games: College students still play board games, card games, and many others. These tend to emphasize strategy elements rather than being completely random games of chance. Some of board and miniature games take hours or even days to play. Sports: Not just varsity football, but impromptu games of Frisbee, pool, air hockey, etc. College students don't need to be physically fit to enjoy running around chasing things. Scavenger Hunts, Raffles, etc. : When these events are organized as fundraisers for college groups, they tend to be quite popular with students. Why Use Games to Teach?